GLASSBORO - Listeners tuning into Patrick Kuhlen's Tuesday night radio show at Rowan University will hear a variety of music in a short time. One night this month, the DJ played the old school punk of the band Bad Religion, the earnest musings of singer-songwriter Ben Kweller and the power pop of the Dandy Warhols, all within one hour. You wouldn't hear anything like that on the heavy rotation video spins on MTV or Top 40 radio. 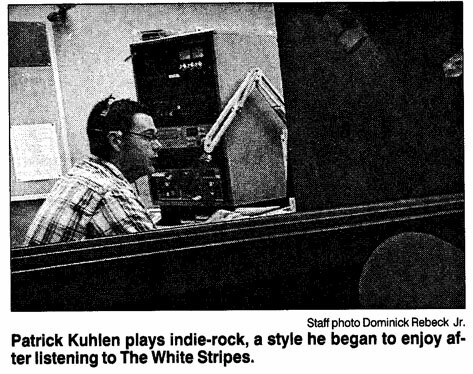 Kuhlen, Bill Menschner and three other Rowan disc jockeys - who work the 9 to 11 p.m. shifts Mondays through Fridays - play variations of indie rock, punk rock and emo (emotionally charged punk rock), as an alternative to the overdose of Evanescence, Nickelback and Linkin Park-type music dominating the current commercial rock scene. Kuhlen, a 25-year-old graduate student who grew up in Haddon Heights, Camden County, started listening to Nirvana and other bands affiliated with Seattle's grunge rock scene while attending high school from the mid- to late-1990s. His taste started to gravitate toward the indie-rock sound when he heard the Detroit guitar-and-drum duo The White Stripes while at Rowan in 2001. This led to his discovery of other indie bands, like Sahara Hotnights from Sweden and The Good Life from Omaha, Neb.. He said he doesn't care for the abundance of studio production now used to create most mainstream rock CDs. "I love playing The White Stripes. They made more out of so much less," he said. Like other college stations, WGLS plays a diverse mix of music during the course of a week, including oldies, classical, Broadway, blues and jazz, but indie rock holds one advantage over the other musical formats. By listening to more alternative versions of rock, listeners can be among the first to hear a musical act that the mainstream may embrace later on. And those current performers probably will maintain their popularity over time whether their music receives airplay on college or commercial radio. But, since the 1970s, some bands originally played on college radio have later received commercial radio and MTV exposure. The now-defunct New York rock band Talking Heads dominated the college music scene in the late 1970s and early 1980s before its first Top 10 hit, "Burning Down The House" in 1983. The Athens, Ga., rock group R.E.M. spent seven years receiving college radio airplay before "The One I Love" received significant commercial radio airplay in 1987. Many college radio station considered Nirvana's 1989 debut album, "Bleach," a staple of the rotation., Two years later that the band's 10-million selling album "Nevermind" altered the rock music scene. Hearing Nirvana's music in 1993 changed Bill Menschner's life when he entered Buena High School as a freshman. 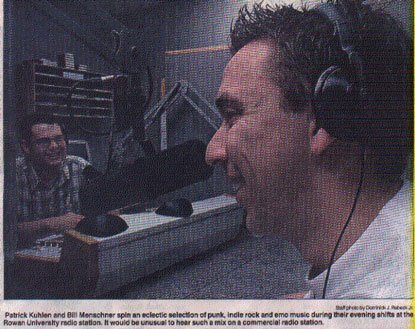 Soon, he was checking out the bands that influenced Nirvana, like the Breeders, Sonic Youth and the Meat Puppets - all bands that college radio had supported during the 1980s and 1990s. 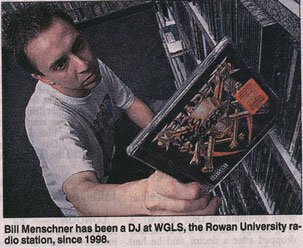 Menschner, a resident of Minotola in Buena Borough, brought his love of indie rock to WGLS where he has done a radio show since the summer of 1998. His current show airs 9 to 11 p.m. Wednesdays. When Menschner, 25, finishes his master's degree in writing this summer, his academic ties to the university will end, but his name will appear on the station's schedule in the fall doing a show with Kuhlen. Doing a college radio show while no longer a student works for Menschner as long as he's having fun, he has the time and general manager Frank Hogan allows it. "I always felt that if I can turn somebody else onto music, that's good," Menschner said.